When searching on the Internet for a product or a range of products that you want to check out, there is a way to do this that can save you a lot of money. Let’s say that you want to look at nail care and you want to buy something in this range. Instead of going to Google and typing in the keyword, go to VoucherBin.co.uk and type in “nail care” and you will get a selection of sites that you can visit and save money by using the coupon code provided. 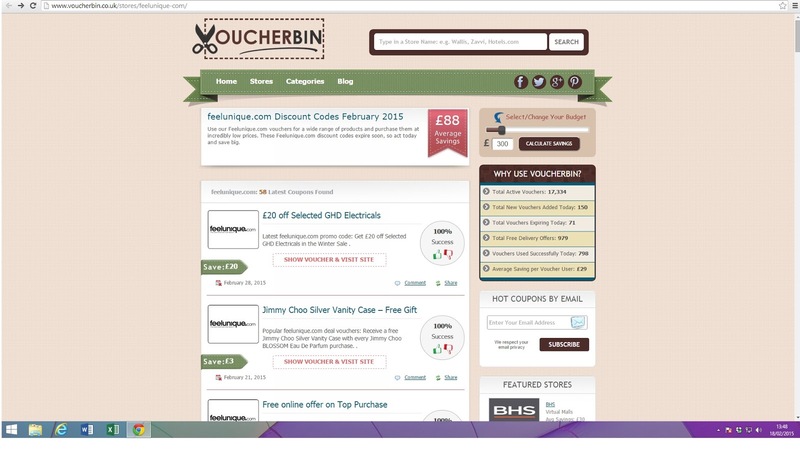 VoucherBin is a site that offers discounts from virtually all of the major UK retail stores. You should really check this out before you buy anything online as you will be amazed at not only the selection that you have, but also the amount of savings that can be made. If you look at this site Feelunique you will end up spending ages just browsing through the selection that is presented to you. They have everything that you could ever wish for from a Beauty store, from fragrances, makeup, nails, skin care etc. The nail care section is extremely comprehensive and you will be able to get everything that you were looking for from Feelunique and also saved yourself some money into the bargain. The amount of false nails available was mind blowing. The manufacturers included L’Oreal, ncLA, Elegant Touch and a host of others. By looking at the main menu on these sites you will be pleasantly surprised to see the amount of stores and retailers that are offering discounts. High Street names like Debenhams, Bonmarche, BHS, La Redoute etc. were all there amongst a myriad of others. Your shopping experience will never be the same once you get used to using a voucher site to get all your needs. The other advantage of this is that you will find a great many retailers that you have not heard of previously. You will have tremendous fun just browsing through the retailers that are new to you and discovering lots of items that will be useful in the future. When looking for gifts, you can return to this site to get lots of ideas. The advent of voucher codes is not new, and many people search out these codes prior to making a purchase. However, having a site where there are so many stores offering bargains is not only a good way to save money, it will save a tremendous amount of time in looking for individual vouchers and bargains. In future, make voucher sites your one stop shop when searching online. You will not only have more choice that you could ever need, but you can get some great bargains that would not have been available had you gone directly to the retailers site via Google. When it is time for Christmas to come round again, you will be spoiled for choice. You cannot top this for convenience and enabling you to save money as well. I've never heard of a Voucherbin website before. I like voucher sites so will have to check this one out as well. I shall have to have a look at their beauty section, now I have children there isn't much spare for beauty products! You can never go wrong with vouchers and discounts - thanks so much for the tips! We haven't used voucherbin but we do use a similar site - you can save a reasonable amount of money this way. Will have to try out voucherbin too. I always check for online vouchers for any store, have saved loads over the years! I'm pretty sure I'm signed up to this site! Love voucher sites - I manage to get a fair bit from them. I used to watch "Extreme couponing" and wished we have more vouchers for groceries in the UK ;) Now I switched to Aldi so it makes my shopping bill much smaller and I finally realized what is this all about - you often buy stuff you don't need just because you have a voucher. I have never heard of this website before but I'll have to pay it a visit. Sounds great and who doesn't love are bargain! never heard of this site but totally need to check it out! Ooh I've never heard of Voucherbin before, will have to check them out, I like that it's discounts from the mainstream stores.